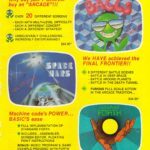 Accelerated Software released a number of titles on the C64 back in 1984, but their advertised Space Wars game was one which never quite made it. Was it possibly due to the games market crash at the time? Or was it just a limited release that still needs to be found and preserved?